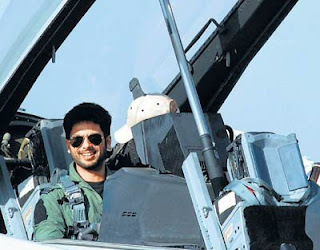 Actor Shahid Kapoor, who while shooting for his film Mausam had the rare experience of flying multirole jet fighter aircraft F-16 takes pride in being the only film actor to have flown that ultimate flying machine. "I was quite fortunate that I flew an F-16 fighter plane. I don't think any other actor has ever flown a F-16. Even when actor Tom Cruise had done 'Top Gun' he had flown an F15. I was very fortunate to get that opportunity. It was a very exciting experience for me," Shahid told reporters, while launching the first look of the film at the PVR on Monday. The actor had flown the American fighter aircraft at the AeroIndia defence exhibition in Bangalore earlier this year. Sharing his rare experience, Shahid reveals, "Honestly I was not fond of flying in a plane but when I actually sat in it and flew it I was so excited that I started shouting. It was probably the most exhilarating experience one could have. I am someone who loves speed anyway. So, the fact that I was sitting in a F-16 and I was a co-pilot was unbelievable. I also went through G force. If you know when you fly such a plane you can go up to G9. G1 is when you feel your body weight; G2 is when you feel two times your body weight. He (The co-pilot) took me up to G6. That's something I would take through my grave with me." "I think it was required to understand my part better and it helped me to understand what all goes to become a fighter pilot," he added. Shahid closely followed the attitude and mannerisms of the Indian Air Force pilot during his visit in the bases. "I visited some air force bases to meet some air force pilots; I sat on the aircraft, I put on the G-suit, observed how they walk with the helmet. All things like that which actually gives you some kind of perspective of what it is to be representing the country and to be the part of the arm force and to be an Air Force pilot. It's interesting to know that the value of an air force pilot is Rs.300 crore in an average because that's the money invested to make an air force officer over a period of time. He is an extremely valuable commodity. They are taken extremely good care of. They all met me like 'Oh tu to hero hai, haan thik hai'. They all have this attitude, which is awesome. They are the real heroes," said Shahid. Mausam is the directorial debut of father Pankaj Kapoor. The film is a a love story which also stars actress Sonam Kapoor playing the lead opposite him. “Mausam is about the seasons of love. It's about different emotions and different situations that the couple goes through. That's the theme of the film," said Shahid. The film Mausam is set to hit theatres September 16.